Broadcasting of some court proceedings has moved a step forward, following approval of plans to allow filming of the legal arguments and the final judgments in criminal and civil cases in the Court of Appeal. Subject to the approval of the House of Lords, the Government hopes that this will start at the end of October 2013. The government plans to permit filming to allow the broadcast of sentencing remarks in the Crown Court. However victims, witnesses, offenders and jurors will continue to be protected, and will not be part of broadcasts. The date for the launch of this has not yet been announced. This will, of course, supplement the broadcasting of cases in the Supreme Court which is already available. Publication of the A level results is an occasion of high emotion. For those now in a position to be able to go on to the university and course of your choice, congratulations! For those who have not achieved as expected/hoped, commiserations. But don’t despair, there are plenty of alternative routes to your final career choice! Those planning to study law are about to embark on a subject that is of central importance to your lives – just think of the importance of the concept of the rule of law in the modern world, and the difficulties of living in places where there is no rule of law. The study of law is a hard discipline, requiring the development of acute analytical skills, but these days also other skills such as written and oral communication. Those thinking of becoming lawyers will find a world that is in rapid transition, that will be quite different from what it was even 10 years ago. Not only are rules of law subject to change – with new law being made all the time. But the institutions of the law are undergoing great change. New ways of doing legal work, new competitive challenges, new court procedures, new ways of resolving disputes. 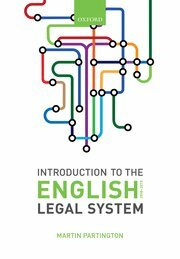 My book Introduction to the English Legal System seeks to introduce you to think new world that is changing so rapidly. This blog is designed to enable you to keep up to date as you work your way through your course with what is happening in the wider legal world. Oxford University Press have just published a short video in which I introduce a few of the main themes. Go to http://www.youtube.com/watch?v=_jyo3QldQDo. For a bit more detail go to the ‘about this book’ and the ‘about this blog’ pages – you can find links at the right hand side of the screen.